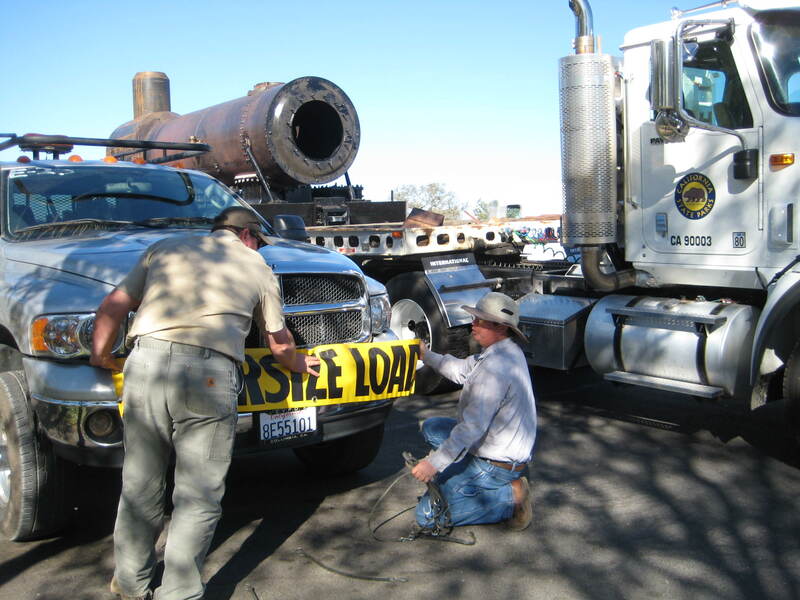 Brendan Simunaci and Mark Johnston attach the oversized load banner to the pilot truck. 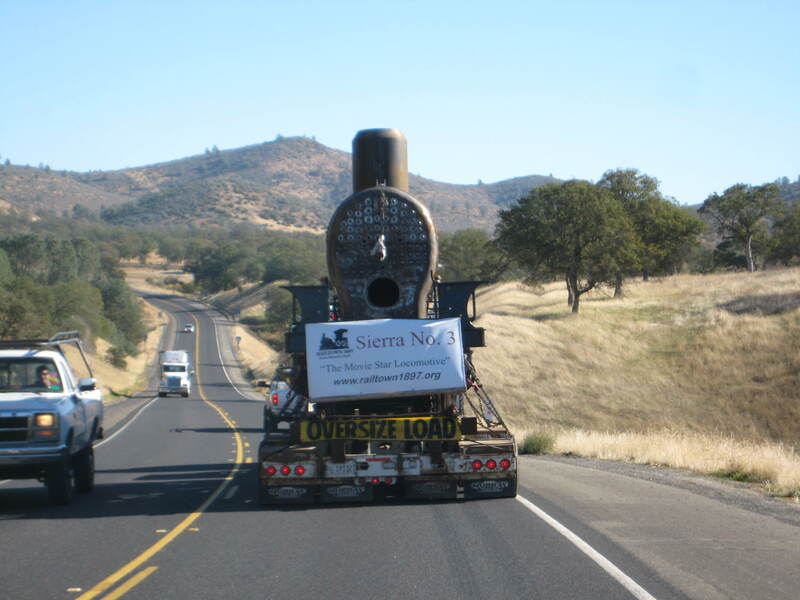 With pilot car in place, we're in the final stretch. 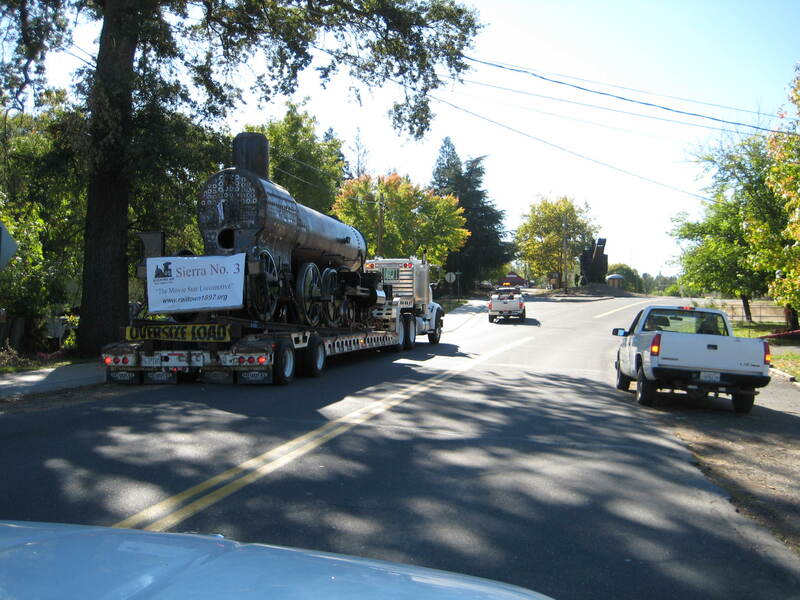 Onto 5th Avenue in Jamestown, some tricky driving was required to avoid low-hanging communications lines. 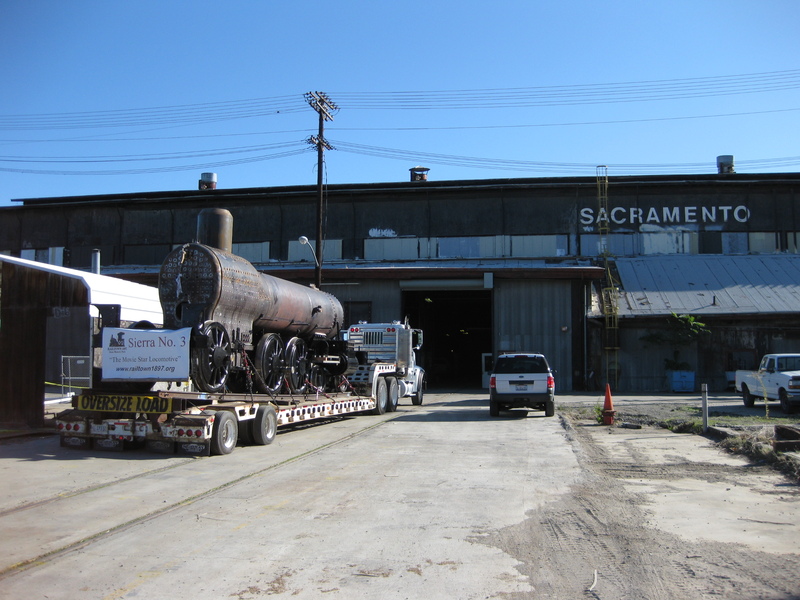 And then, finally, we were in the yard! 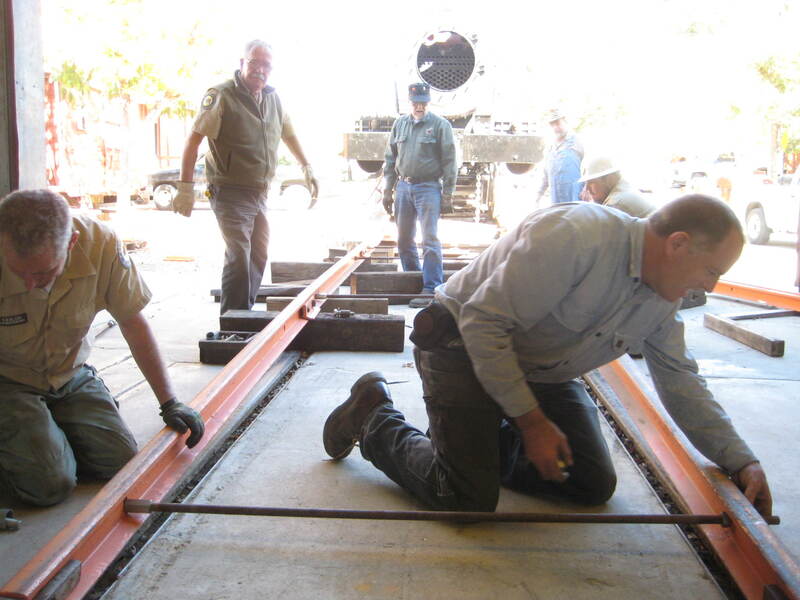 With the truck, and front of the trailer removed, the crew laid out the track ramp for unloading. 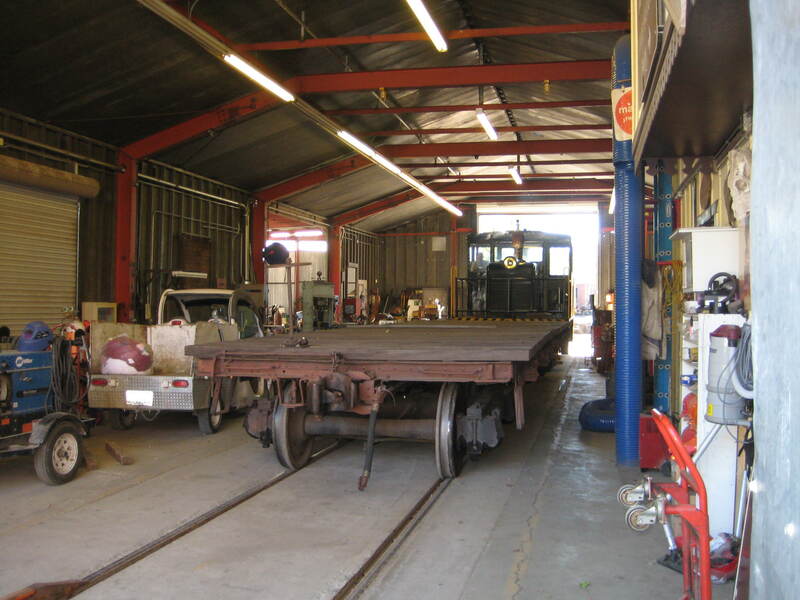 George then drove the diesel and a flatbed car through the shop. 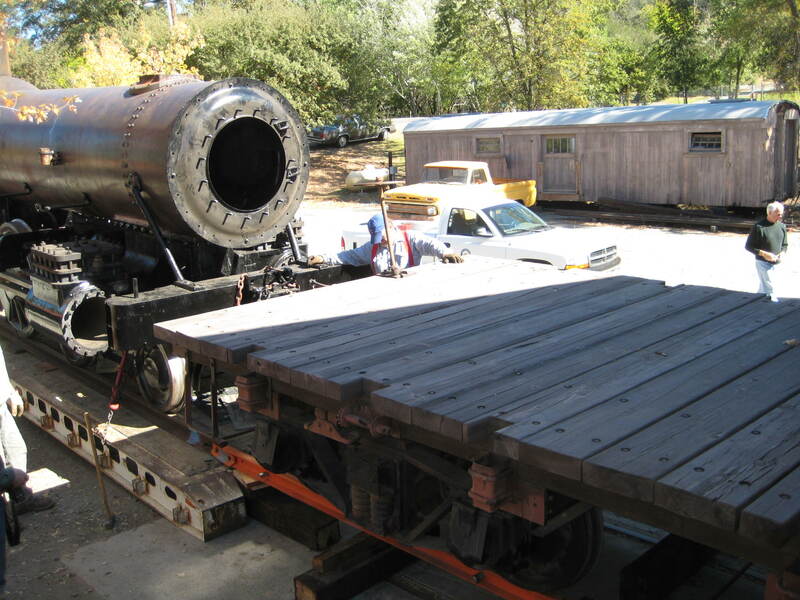 The car then couples to the front of the locomotive, and it is carefully brought down the ramp. 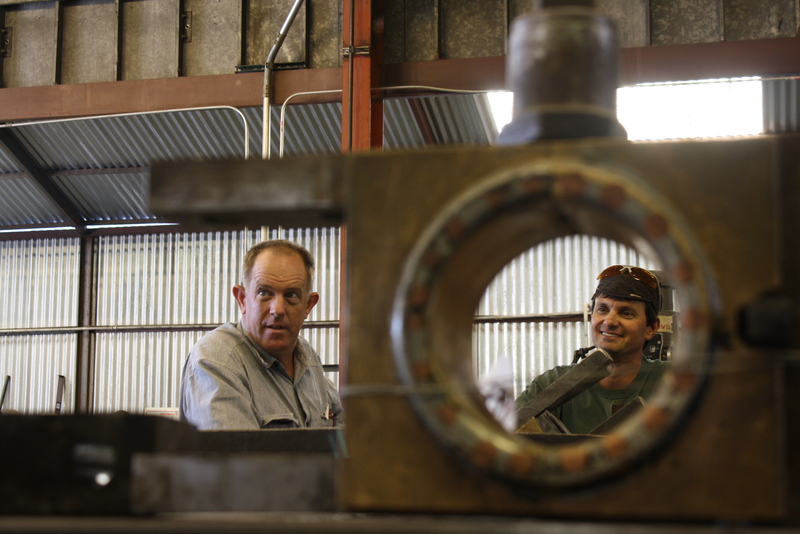 Finally in the Tri Dam shop! 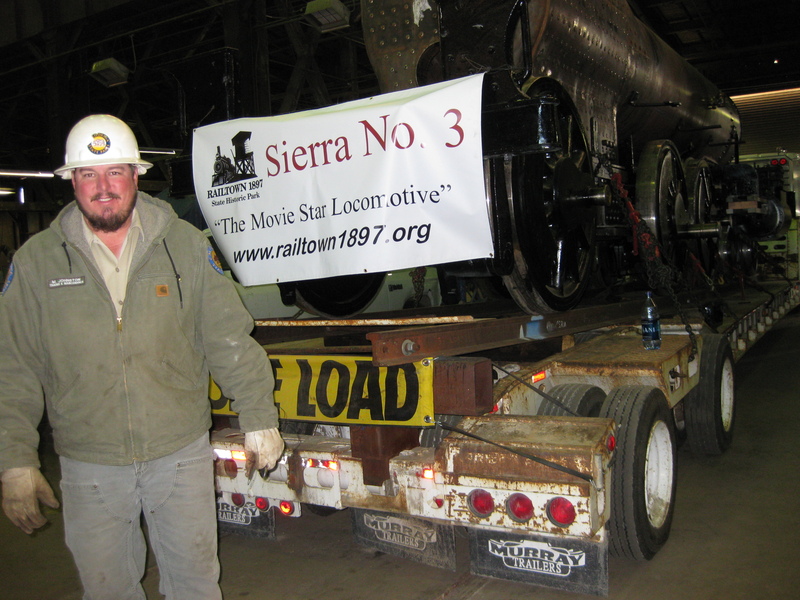 Ready for work to resume on Monday morning. 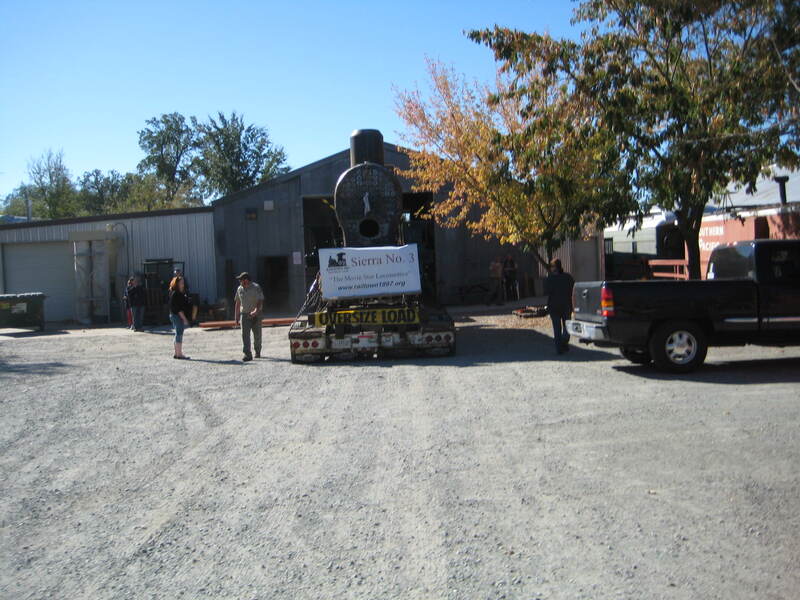 On Thursday, October 29th, the #3 will be shipped back to Railtown. 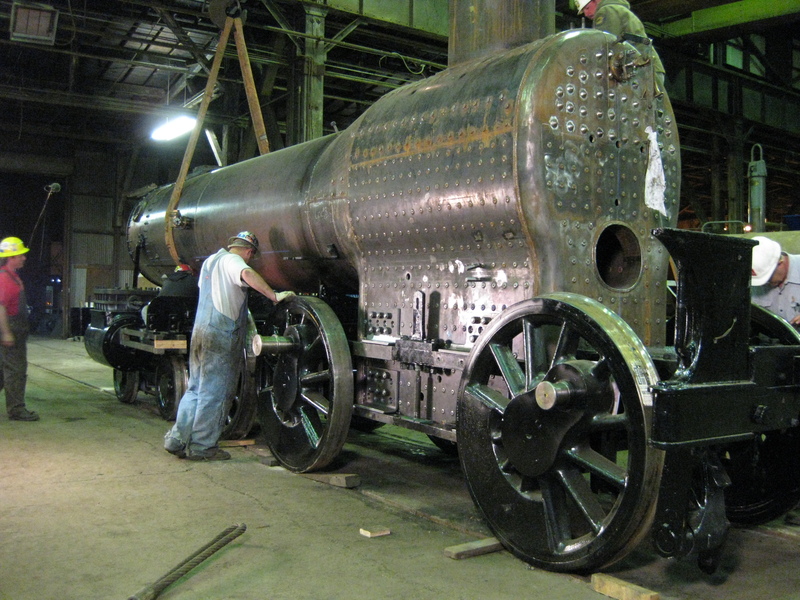 Consisting of the new boiler, the chassis and the driving wheels, it doesn’t quite look like a locomotive. 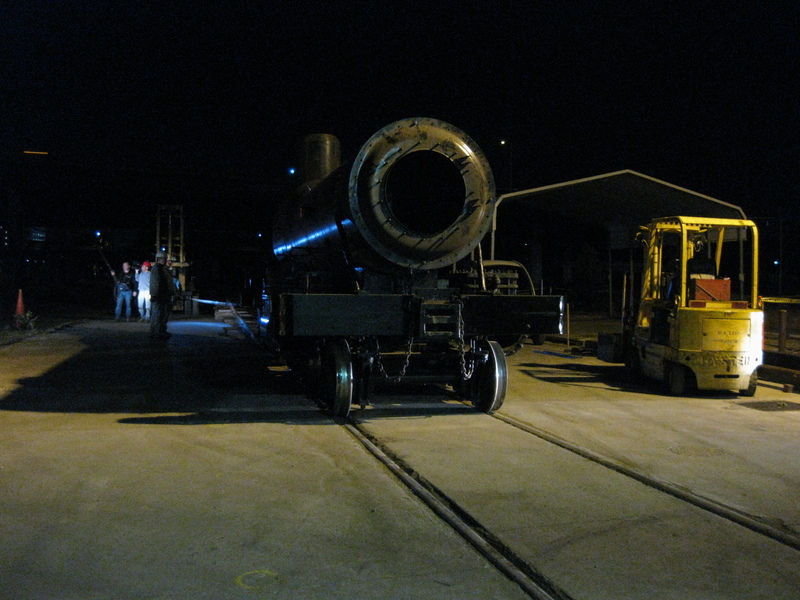 . . yet. 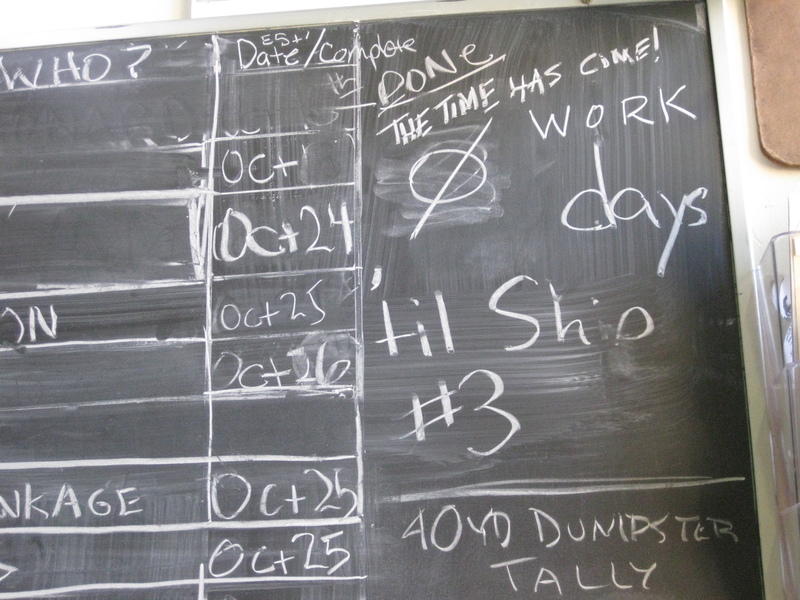 To ensure the ship date is met, it’s all hands on deck, and a long week ahead. 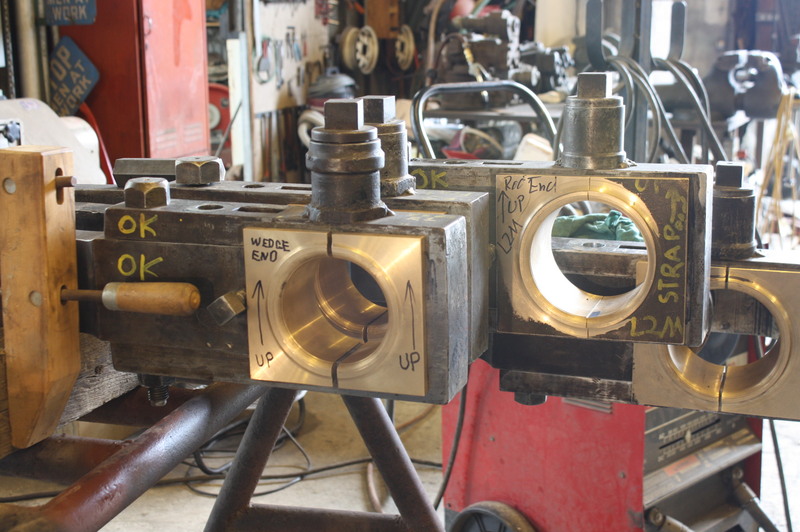 Here’s a look at what could be seen in the shop today. 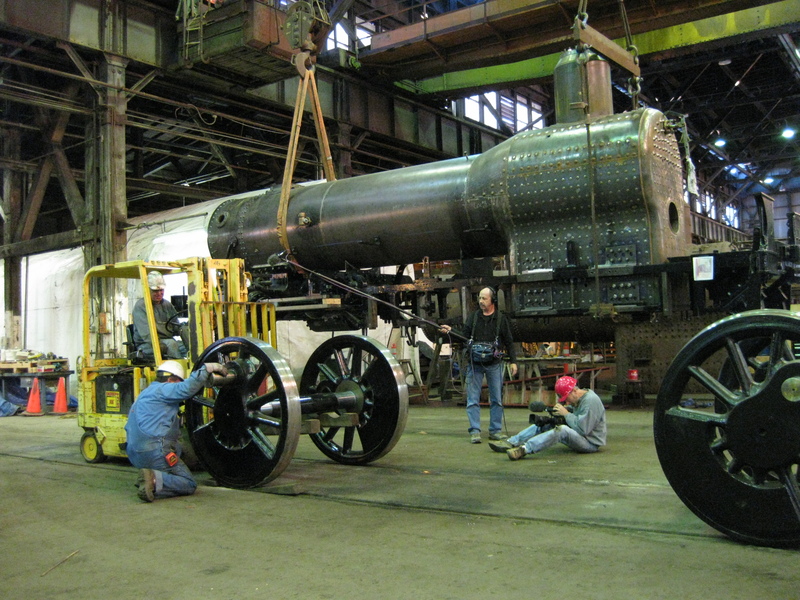 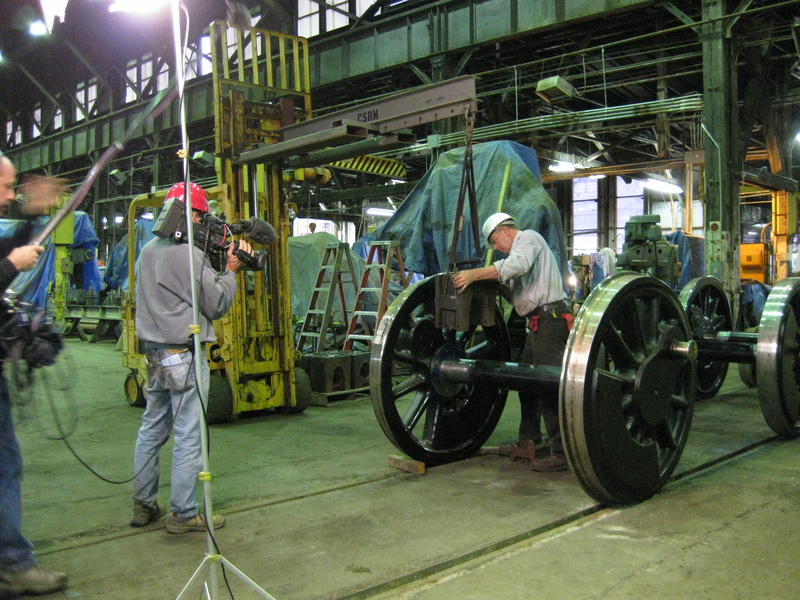 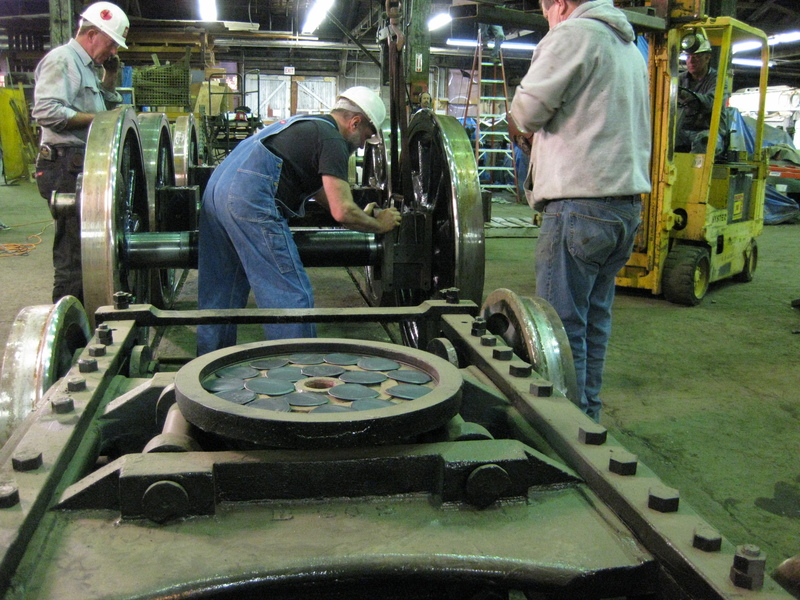 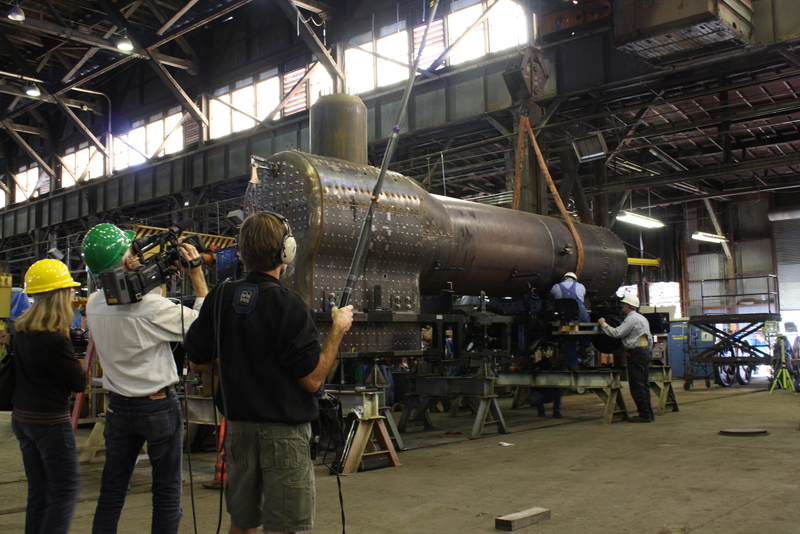 Al DiPaolo and George Sapp adjust the rigging for the final lift of the boiler, while the documentary film crew looks on. 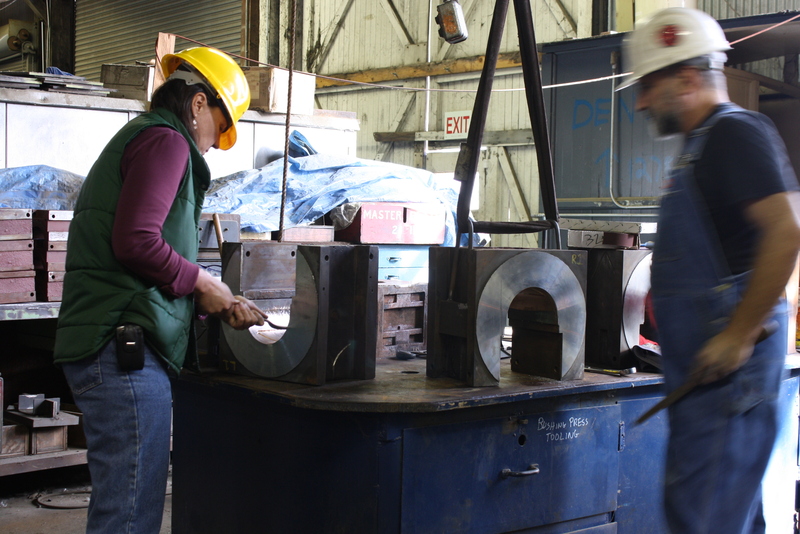 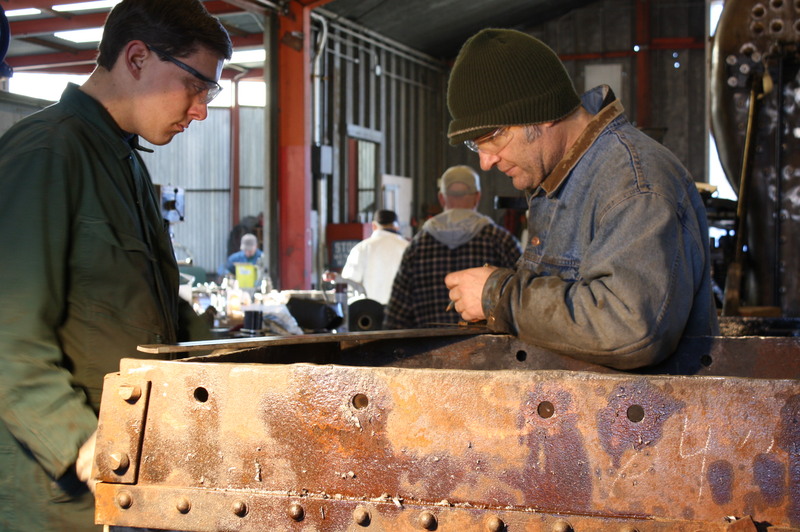 Lisa Smithson and Don Shapiro scrape the bearing surfaces of the driving boxes in preparation for the final fit. 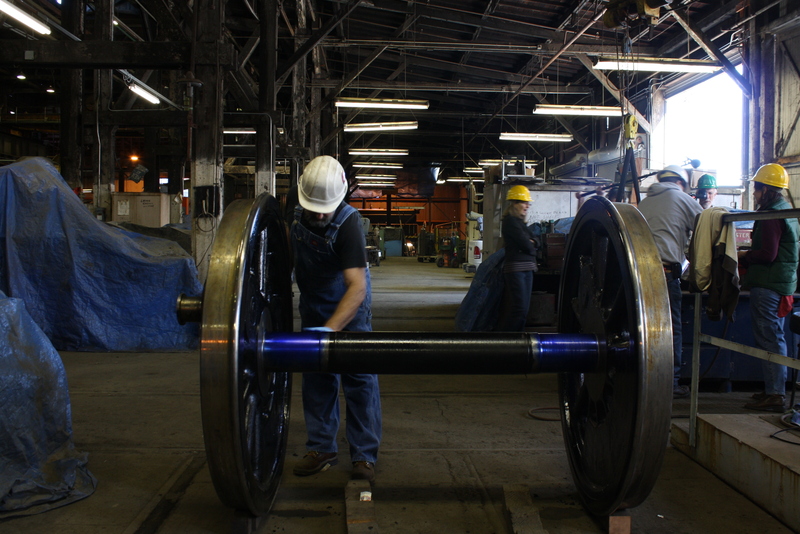 Don Shapiro applies machinist's blue dye to the axles of the driving wheels for testing of the driving boxes. 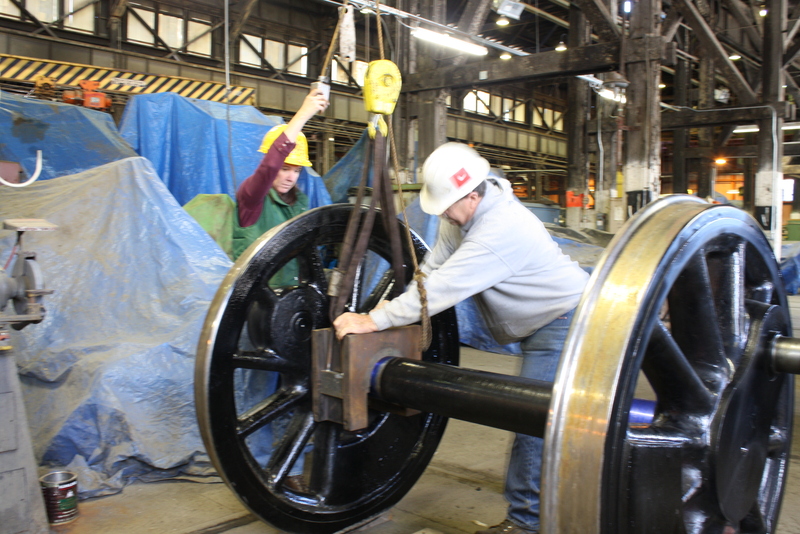 Lisa Smithson operates the crane while Leonard Jones rocks the box back and forth over the dye-covered axle. 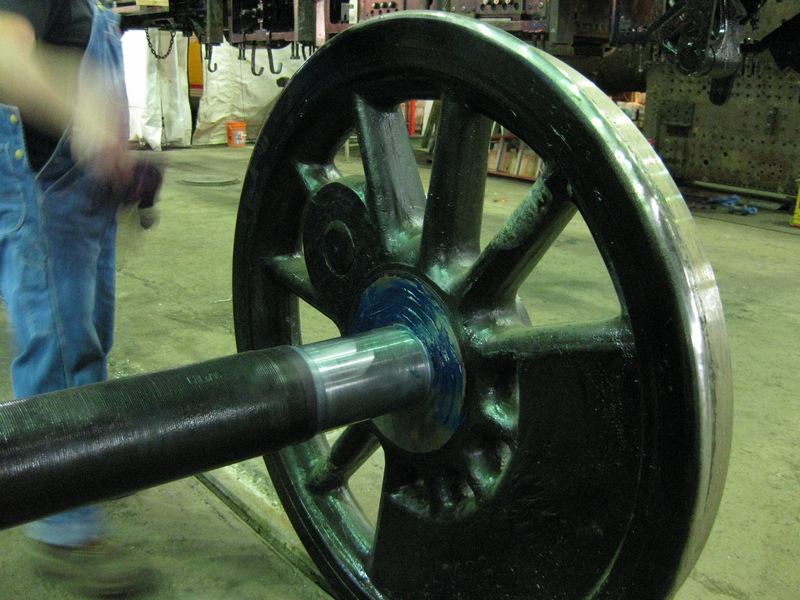 An examination of the stained bearing surface indicates what still needs to be scraped and the process is repeated until the surface is perfectly married. 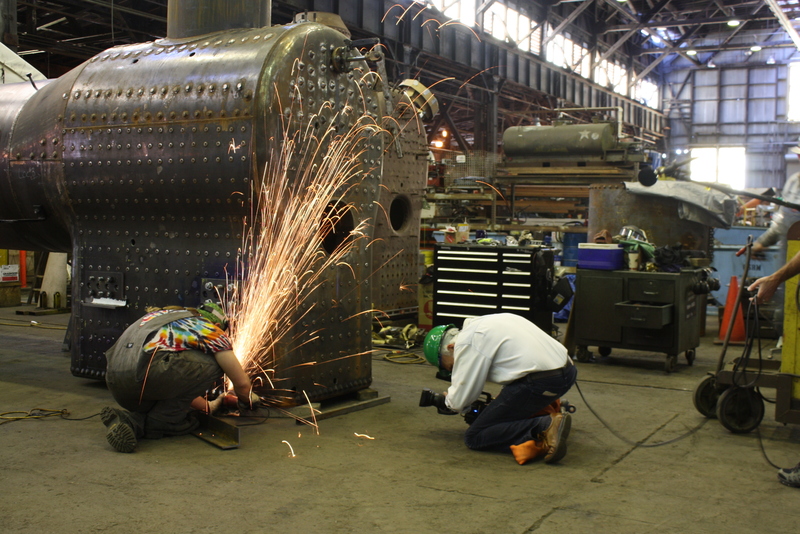 With the boiler on the ground for the final time, Dennis "DJ" Ponder grinds down the proud rivets, while being documented by the film crew. 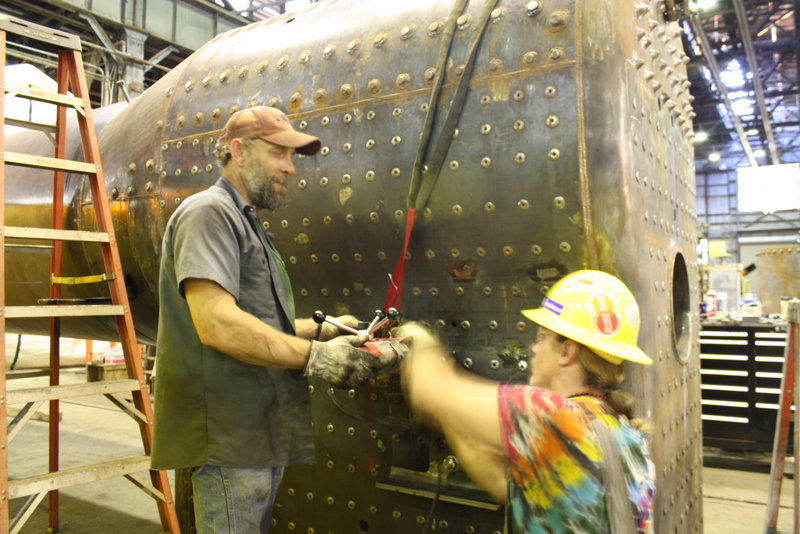 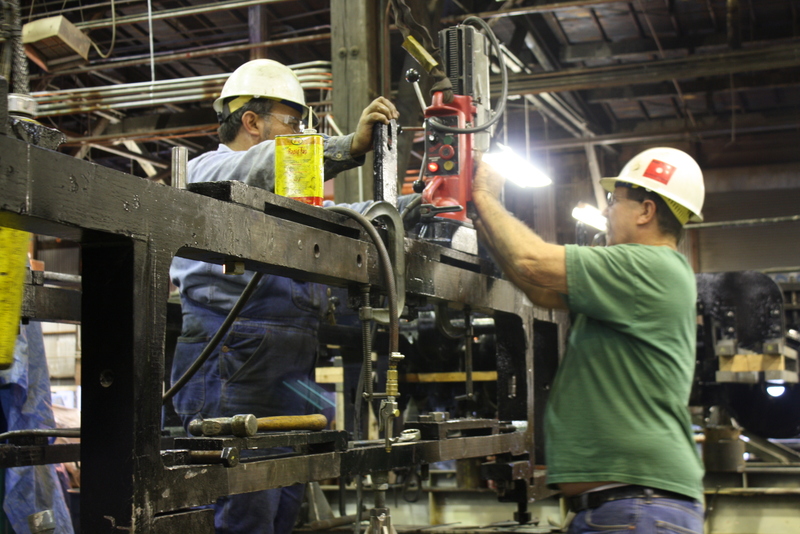 Al DiPaolo and Leonard Jones adjust the mag drill for reaming the furnace bearer strap holes into the frame. 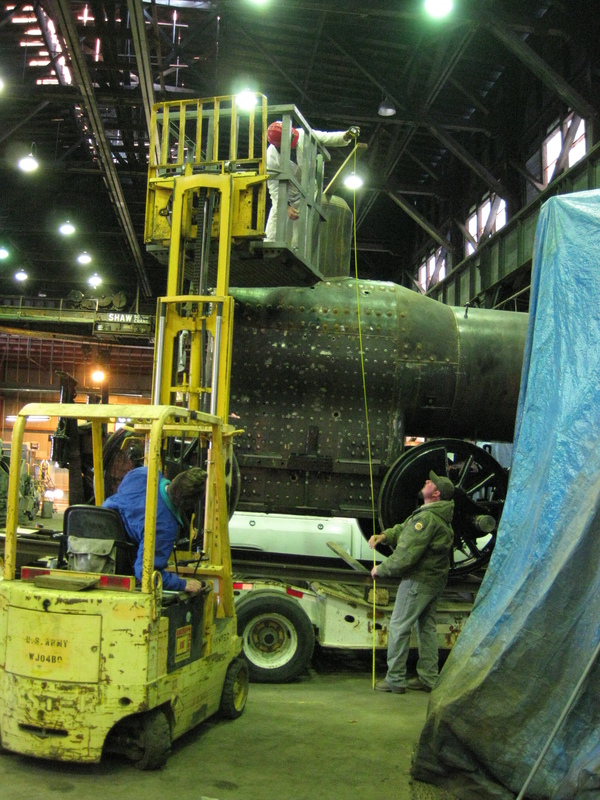 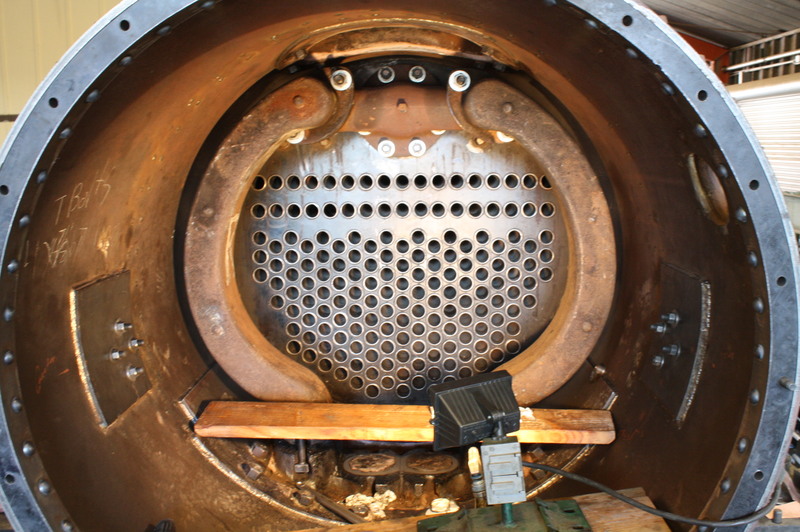 One of the last items needed prior to the permanent attachment of the boiler. 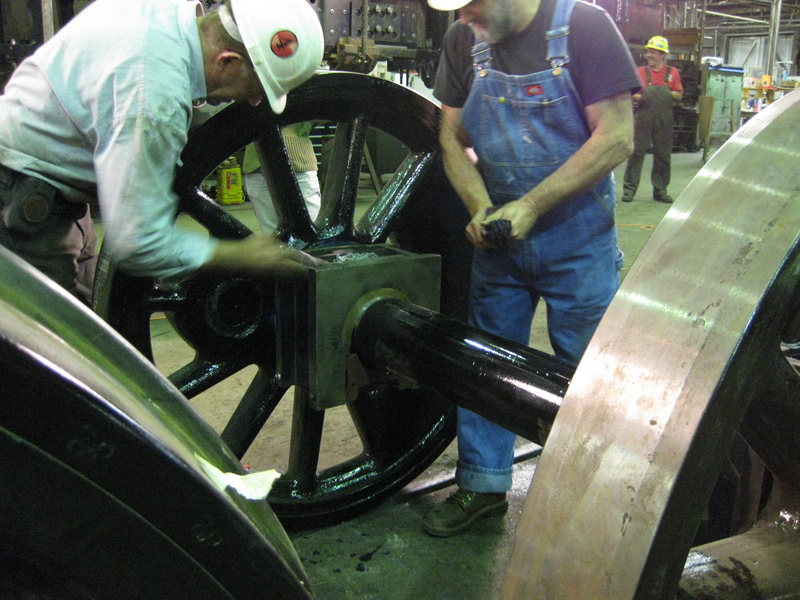 Phil Hard and DJ Ponder adjust a mag drill to ream holes for the running board studs. 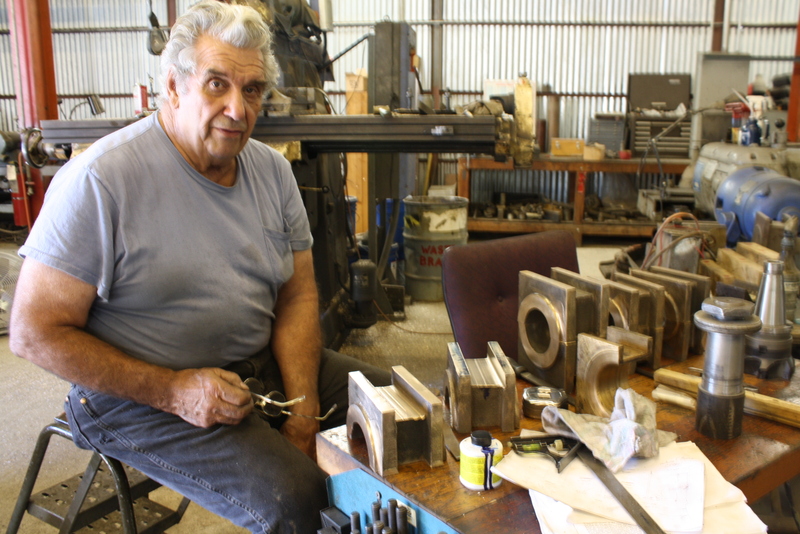 George Sapp cuts stock for bolts at the end of the day, foreshadowing Monday's activities. 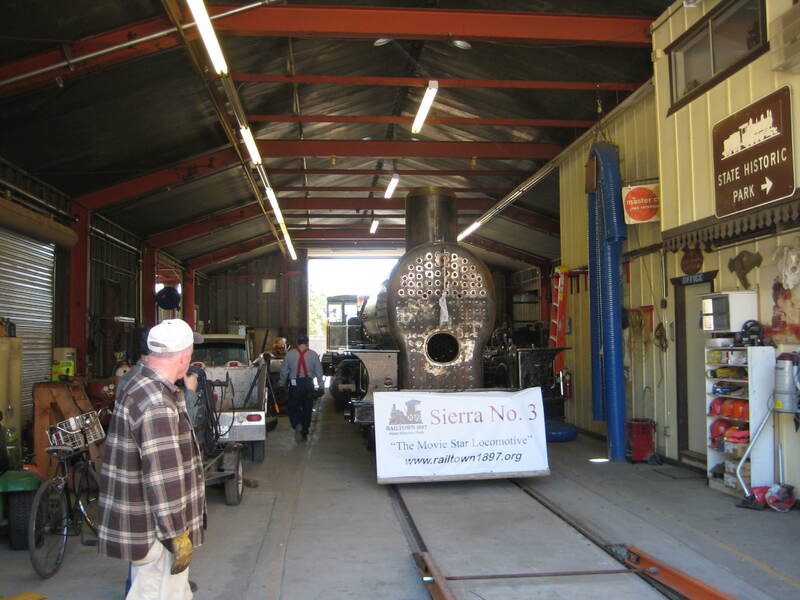 Most of the workforce is now at the Sacramento Shops, where work on the Sierra #3 boiler is now occurring 7 days a week until the target return date of October 29th. 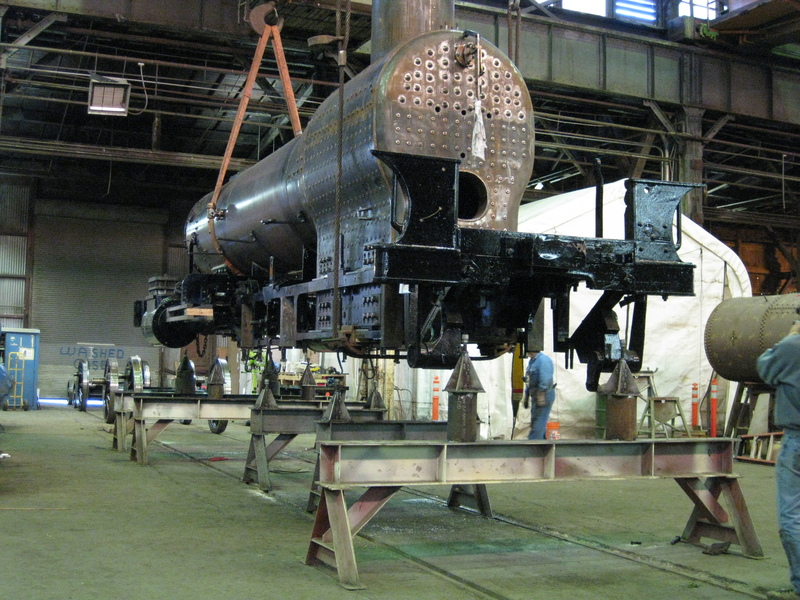 In the meantime, activity continues at Railtown’s Jamestown shop, just at a quieter pace. 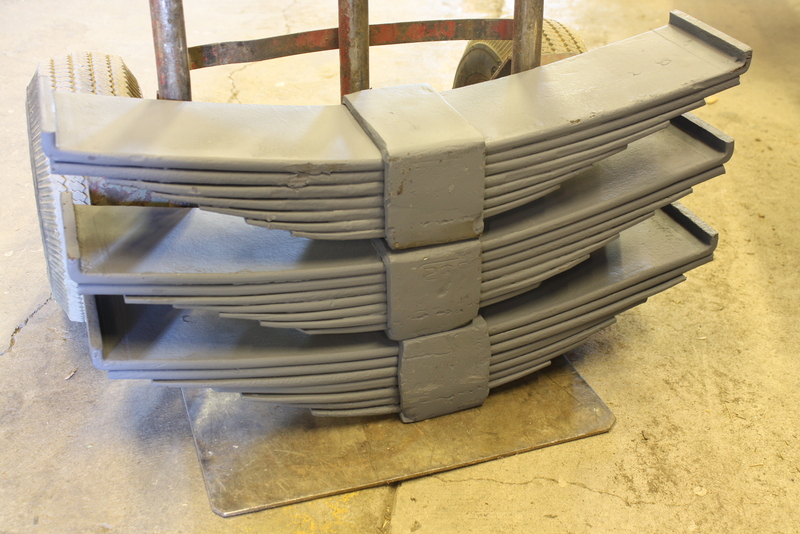 Newly manufactured leaf springs have arrived, ready to paint and install on the tender trucks. 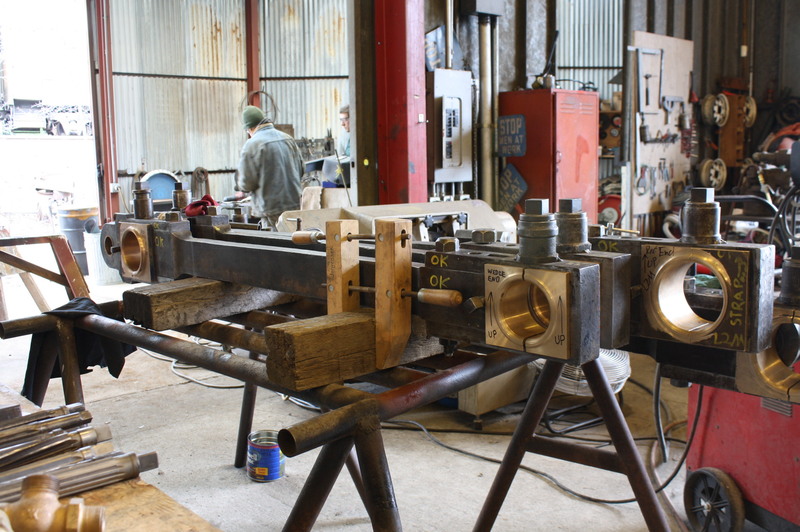 Previously repaired rod brass, frames George Sapp and Erik Young at the Jamestown Shop. 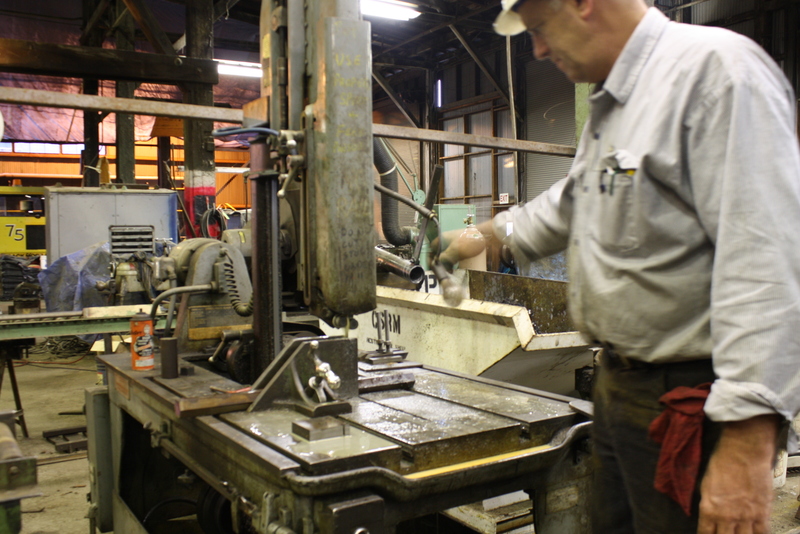 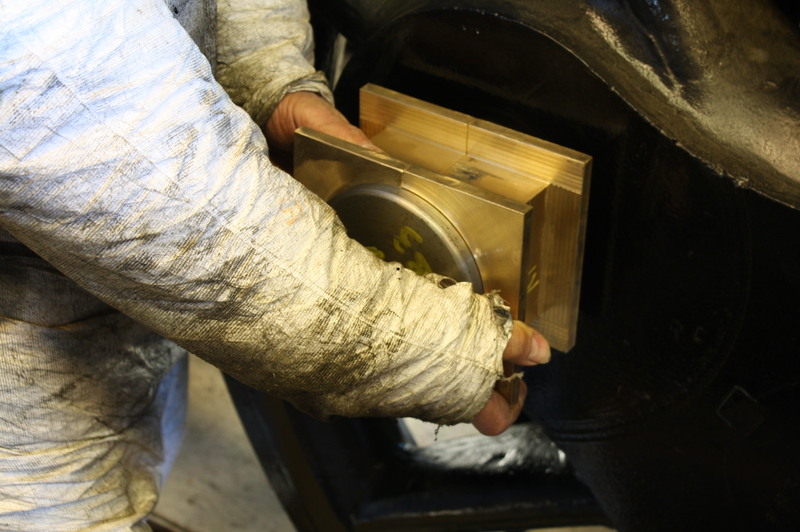 Bob West is preparing newly cast rod brass to machine to fit the new crankpins.